When a single object-language element is rendered by several metalanguage elements (category labels), these are separated by periods. Ex: ANN.SG.M (Rule 4 of the LGR). 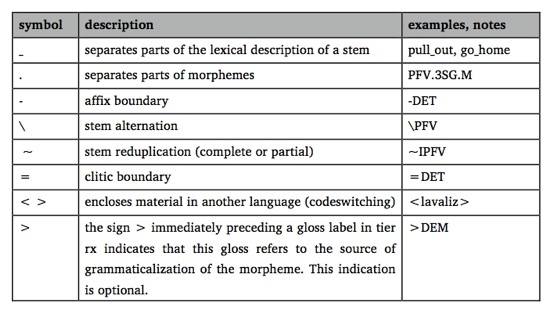 Glosses reflect the order of elements: prefix(es), stem, suffix(es). The ordering of elements within a single tag reflects a general principle “the more inclusive (general) category precedes the more specific one(s)”. If you wish to add a gloss to the list, please submit your proposal by filling in the following form. Your suggestion will be examined, and added to the list if it fits the requirements of the LGR and the CorpAfroAs extensions. Thank you.